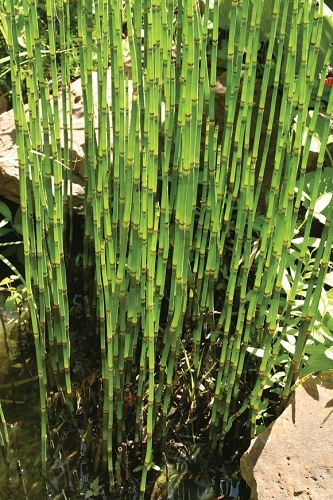 Scouring rush (also known as horsetail) is a primitive plant that has existed for millions of years. The sandpapery stems have been used to scour pots and pans and other cooking utensils. Musicians still use them to polish the reeds of their woodwind instruments. They've also been used to polish furniture. Dragonflies use them as a place to perch. The evergreen foliage provides a nice vertical accent; however, it is an aggressively spreading plant and may be best controlled by growing in a container that is either a decorative pot for the patio or a pot that is buried just enough so that the plant can't escape into the flower bed. Container grown plants should be in pots that have no drainage.